Introducing the new ISO Transfer series duplicator with PRO features of 500GB Hard Drive and USB 3.0 from the premium series line of Spartan Champion. The Spartan Champion ISO Image transfer duplicator is Stand-alone, no PC needed, DVD duplicator which featuring ISO image Technology that can transfer from your PC via USB connection to the Hard Drive storage in the Duplicator (the Hard Drive then can proceed to duplicate ISO image via HDD to Discs copy function only). Now with the new CD and DVD ISO image Transfer Duplicator, you can store your ISO file format with your photos, text and artwork-directly onto your discs via Hard Drive to Disc function. Make a simple storage transfer from USB to Disc . The Spartan Champion also offer a simple back up copy from your PC by having one of the burner to be an external burner usage via USB 3.0 from your PC to one of duplicator's burner (only one drive will connect via USB 3.0). Simply put your master in reader drive, and new discs in target drive to process duplicating. Then you got everything you want. 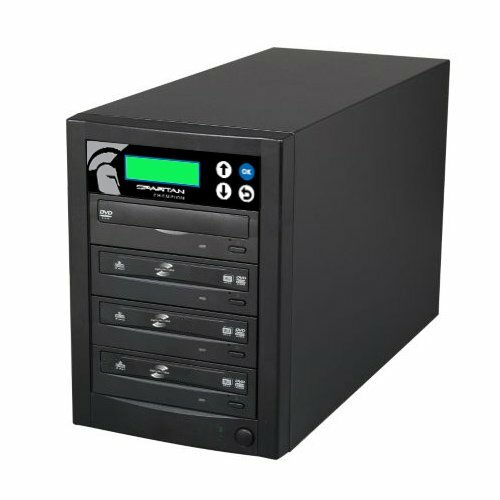 The Spartan Champion series duplicator feature high speed burning at 24x for DVD and Error Avoidance Technology you can change the failed master disc to a working one without interrupting the process. Toll free tech support and 1 year warranty from Spartan. If you have any questions about this product by Spartan, contact us by completing and submitting the form below. If you are looking for a specif part number, please include it with your message.